All cities have been described, at one point, as “full of surprises.” After all, cities are inherently guaranteed to be diverse, made of different neighborhoods, hidden streets, and pockets of culture. But not many cities hide unexpected surprises with the same pedigree as Milan. 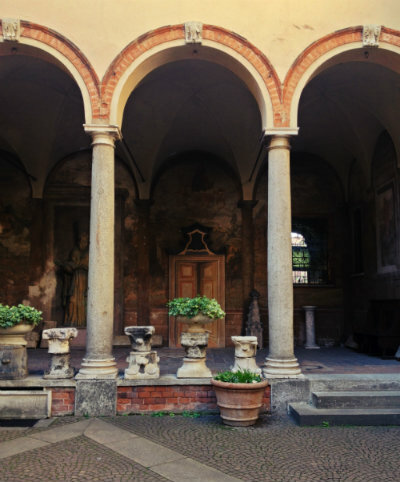 Tucked away in Zona Magenta, just off the southwestern side of Parco Sempione, is the Vineyard of Leonardo da Vinci and the Church of Santa Maria delle Grazie where he painted The Last Supper. I always pictured Leo hanging out with the Medici in Florence, and obviously he did a lot of that. But in the late 1400s, he also befriended Ludovico Sforza, Duke of Milan and of famed ruling family of the Lombardy region (15th-16th centuries) during the Renaissance. 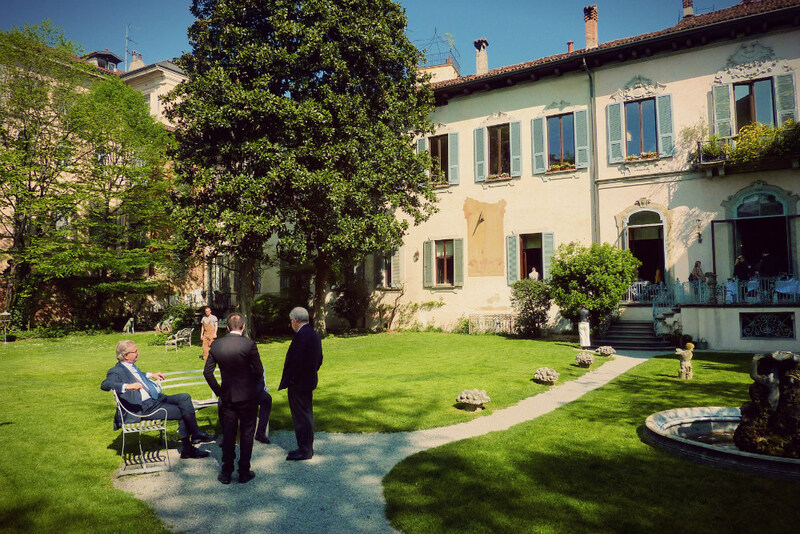 Ludovico gave Leonardo—both 30 at the time, by the way—a stunning villa and his own vineyard. Friends in high places, and all that. Today, the villa, called the Casa degli Atellani, can be visited for a guided tour, and the vineyards were replanted in 2015 in occasion of Expo. The vineyards have an especially interesting history behind them: in 1919, a Leonardo da Vinci expert confirmed that the vineyards planted in the vicinity were Leonardo’s, and that they were incredibly still intact; photos were taken, fortunately, as the vineyards were later destroyed in a fire. The photos were used as a reference to replant the vines. An enologist, a professor, and a geneticist put their heads together and ascertained the grape variety historically planted there to be a Malvasia strain (a popular variety at the time). Today, the vineyards are Malvasia di Candia, and will be used to make a sweet wine. They won’t be ready to produce wine for another several years, but when they are, this small plot of vineyards will join the ranks of the world’s rare urban vineyards—the others being in Vienna, Paris, and Turin. I was fortunate enough to visit the villa this past week on a hot spring day for a media event for (shameless plug) The Grand Wine Tour. It was the first official press conference for the website and project, and I especially loved how all the wineries attended, coming from as close to home as Lombardy to as far away as Puglia: a show of solidarity in an industry and business where, often, producers of the very same region never meet. The Grand Wine Tour was presented in this fabulous carved wood-paneled room, Ettore Conti’s Studio. The paneling dates back to the 1600s. And then came the tasting! 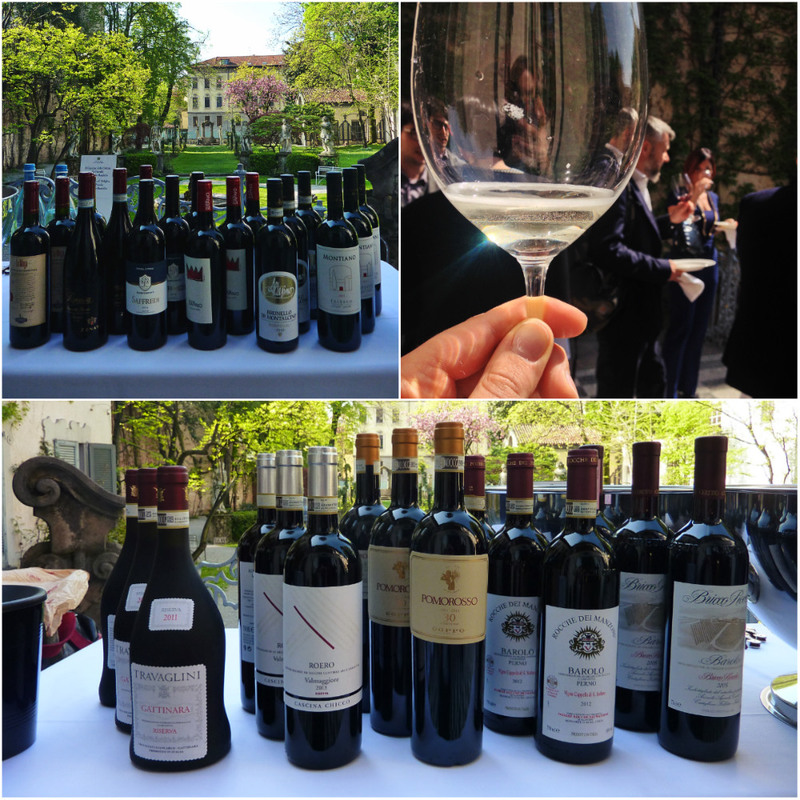 Each winery brought their flagship wine, the label that best represents their winery, and here I just have to say, they were the top wines from truly some of Italy’s best wineries. 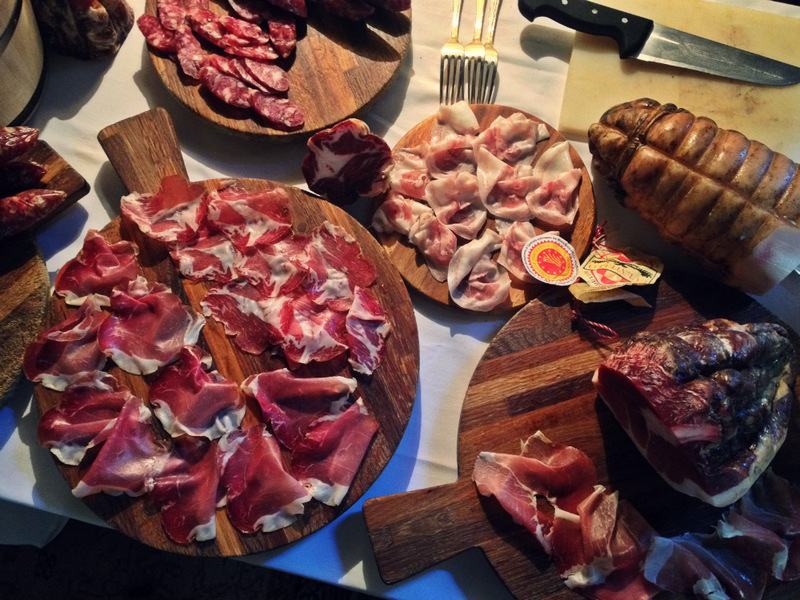 And you can’t have wine without food, naturally, so in addition to the wines we sampled a fantastic spread with Castelmagno cheese (from Caseificio La Bruna), the salumi Culatello di Zibello, Coppa, and Fiochetto (Podere Cadassa), and some crunchy “lingue di suocera,” or crackers called “mother-in-law’s tongue” and grissini (Mario Fongo). And to finish it off, some wonderful nougat, torrone, from Basano Coraglia. 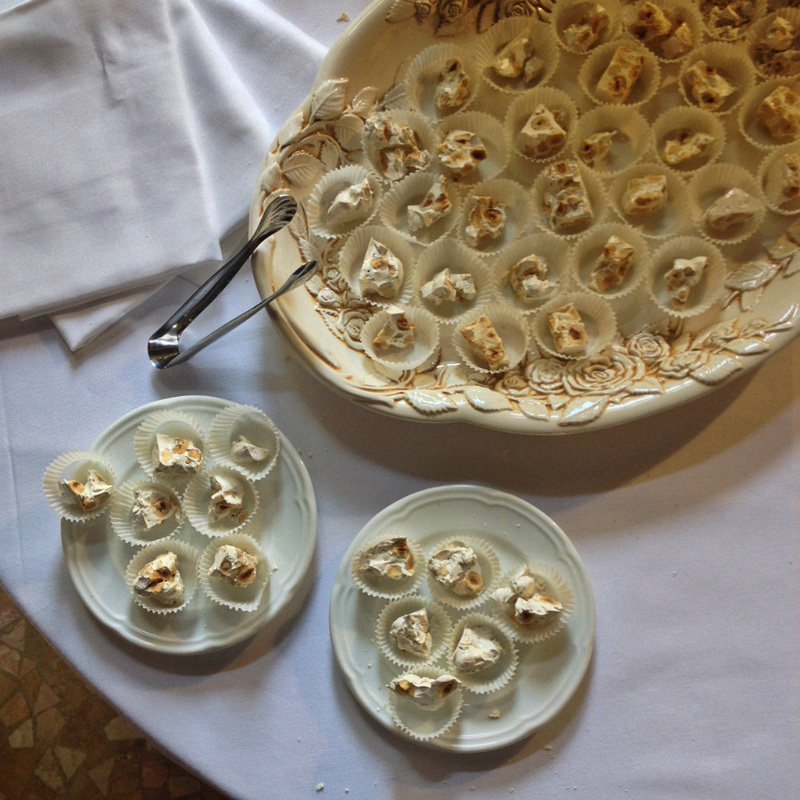 Made with egg white, honey, and nuts, from Piedmont it’s traditional to fold in toasted hazelnuts; and Basano Coraglia also had some tasty bits covered in dark and white Domori chocolate. Very interesting – Leonardo DaVinci’s winery – who knew? You have a great job! I was surprised, too. Florence gets all the attention when it comes to Leonardo da Vinci! Somehow, I’d never wondered why The Last Supper was in Milan, as opposed to the Uffizi. Now I know. Interesting post. Great job! Glad to hear The Grand Wine Tour had a good showing from all of the wineries. Great find! I’ve shared it on my Worldbite Facebook page! Previous Previous post: Wine Pass | Book review. So you want to move to Italy?